Promotional mugs are something every marketing campaign should have… Who doesn't love a coffee or tea first thing when they get to work? So why not put your brand in their mind first thing in the morning. Promo mugs can be made in any style, shape, volume, colour and pretty much anything you can think of. Give us your specifications and we'll serve you a big warm cup of instant solution to suit your needs. If you need help at any point please call us on 1800 330 099, we can help find the right promotional mug for you. When considering a promotional mug for your next campaign, there are many questions you need to ask and the first is definitely the type. What type of mug is your target audience most likely to utilise... after all what's the point of giving them a mug if they won't use it. 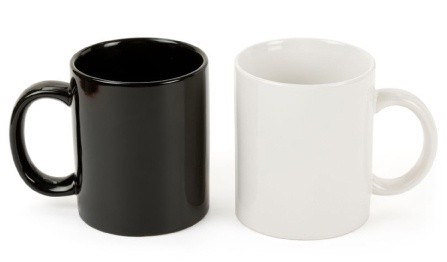 Coffee Mugs - these are great for those in an office environment that don't need lids or non-slip bottoms. Travel Mugs - these would be ideal for someone who's always on the move or doesn't always get to enjoy their coffee straight away. Cafe Style Cups - these are definitely for the corporate types where they want something elegant and sophisticated. Disposable Mugs - definitely the style if you're handing out coffee to the masses but you need something that promotes your brand that is economical yet functional at the same time. The material of the mug is going to be dictated by the chosen style, however it does not limit your material choice. Type and material are very important, but another factor is the shape and the printability of promotional mug. If you have a standard coffee mug shape then you're more likely to be able to print on the entire mug, however if you choose a custom design the print area may be limited. The best place to start with your next promotional mug is to let us know what your desired outcome and purpose is, then we can present you with the best solutions to suit your brand.